Last fall, I went shopping for e-bikes after getting sick of bike+train. Given the upfront investment I wanted to find a way to test my commute and day-to-day riding without buying an e-bike first. I tested a large swath of my commute on test rides and test-rode numerous nice ebikes but needed a longer term “real life” test period of a couple weeks to see how I would (or would not) integrate e-biking into my life enough to justify the cost. Comparing rental rates with the cost of the Grin Technologies Brompton Kit I realized that I could buy myself an interesting project and answer these questions I’ve had for a while: (1) can you really e- a brompton? (2) (a) Does an e-bike improve my current transportation situation, and (b) in particular is my commute any easier e-biking it long distance? Result 1: Yes, you can e- a Brompton. The Grin Tech Brompton kit is awesome. Installation was straightforward and the instructions were clear. It’s a matter of installing a motorized front wheel, adding the throttle, motor controller, and computer, and then routing the cables nicely. After some adjustments the bike folded down as neatly as before, which is a major win–in my view there’s no good in modifying a Brompton if you mess up the fold. Couple of downsides but none of them should be shockers to anyone. First off, the bike is significantly heavier (my initial note was “heavy as all get-out). I am reasonably strong but did not like taking it + battery down stairs and up into train. 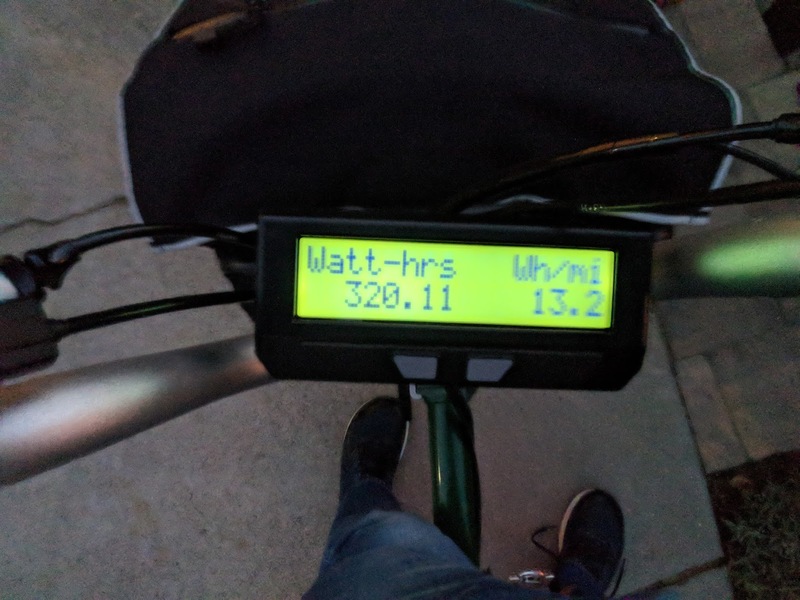 I had a somewhat large battery since I was using the battery pack from the cargo bike, but still most of the weight was the bike. Other downside was that despite the bike folding down properly the whole process took longer. Put another way, I realized that the Brompton fold is not just mechanical (this kit preserves the fold perfectly in that sense) but also a matter of time/tasks: on a standard Brompton you only have to do a few moves (bag, flip/tuck rear wheel, fold handlebars and pull fork in) but the battery-in-bag adds the step of unplugging and handling the wire, which slows down the process. Fiddly? Yes. Possible workaround by attaching the battery to the frame somewhere? Maybe. (b) My commute is not any easier with this e-bike, though that is a function of the commute (distance and rider) more than the bike. For my first test ride, I noticed I was little bit faster than in normal riding. This test ride was at commute-time and just under 8 miles in city traffic. I actually ended up hitting all the worst traffic lights at the worst times but the motor made up for that. I also tested my complete multimodal commute (bike-train-bike) another day. In the morning I made it to the station in the usual amount of time but not as tired as I would be hauling myself at top speed. Still, I only averaged 15mph with traffic & stops in city traffic, which is not much better than I can do on my own. I don’t think this is an e-bike issue as much as it’s a “riding in city traffic” issue. A high point of this test was the evening commute. The electric assist truly shines when I’m not “feeling it.” Specifically, late fall / early winter evening rush hour commute has always been my “I ought to quit biking” time. With the motor, when I want to quit trying, I have an option. Actually I think that may be the ultimate selling point for e-assist: you can ride a bike, but when you feel like quitting you’re not stuck riding a bike, you have a motor. I also enjoyed this advantage one night when I went to pick up some dinner rather than waiting for delivery–diy food delivery @16Wh/mile is super convenient. One of the main goals of this test was the speed question on open trails/roads–could it be competitive to simply ride all the way, assisted by the motor? The answer here is “yes.” I made it home (between 16-18 miles) in 1hr 5 mins, so the bike did meet the test. One thing I wasn’t ready for, though, was the experience of biking for that long. 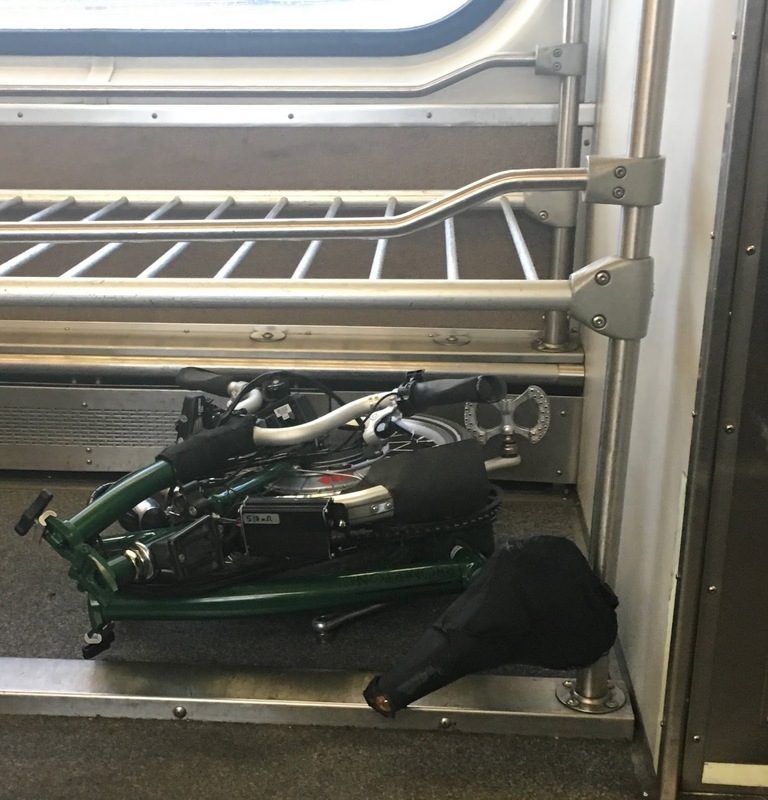 My typical commute ride is 10-20 mins of stop-and-go riding, sitting (or standing) on the train for 20 mins, and then another 10-20 mins of stop-and-go riding. On weekends I may ride longer but I bring the kids along, so we are stopping for snacks, birds, or other interesting sights. Despite the successful test, I re-converted my Brompton back to “classic” mode. Taking it all into account, I need a regular folding bike more than I need an e-bike right now. I also surprised myself–I’ve had the Brompton since 2008 and found that I was a bit sentimental about modding it up so much. As much fun as the conversion process was, I was happy to put it back to normal as well. Keeping the kit for now in case I run across a secondhand Brompton. PreviousFAQ: Oh no, what if I get a flat tire on my cargo bike? NextHow Do I Bike to and From SJC Airport?